Packing lunches for your back-to-schoolers is no easy task. At Wee Care Pediatrics,your Davis County pediatrician, we know that packing a lunch takes time and planning. Plus, every parent knows that just because you pack it, doesn’t guarantee your kids will actually eat it. However, this doesn’t mean you have to fill your kids’ lunchboxes with pizza and cookies everyday. If you don’t prepare your child’s lunch far enough in advance, you run the risk of packing or buying a lunch that is loaded with extra sugar carbs, and very little nutritional value. All of this can lead to your child feeling tired and sluggish. 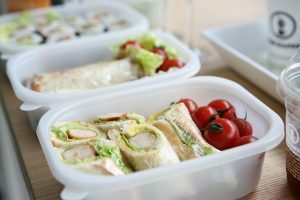 Below your Layton Pediatrician offers 5 tips for how to pack a nutritious lunch that your kids will look forward to eating and will make them feel great! When possible plan the night before and get your kids to help. Give them choices to help you pack their lunch. Then they will be more likely to eat it as well. Taking them grocery shopping with you and letting them have a say (to a certain extent) in what goes into the cart will give them sense of responsibility and empowerment. Just because you’re pacing a nutritious lunch doesn’t mean you can’t offer healthier alternatives to the sweet or salty treats your child craves. You can also pack stickers, notes, and small toys to keep lunch interesting and fun. Use cookie cutters to make shapes out of bread, deli meat, cheese, or a melon-baller for fruit. You can also create a theme for the day and have all of the foods in their lunch relate to the theme. Kids rely on snacks to keep their energy up, but the type of snack is important to consider. Packaged snacks tend to lack important nutrients and can be high in sugar and sodium. Take control of what is in your kid’s snacks by making them yourself. Fruits- fresh, frozen, dried, canned or baked. Veggies- fresh, frozen, or baked. Lean Protein- Baked chicken, deli meats, hard boiled eggs, beans or nuts (follow any nut allergy regulations at your child’s school). Dairy- milk, cheese or yogurt. Whole Grains- pita, sandwich bread, tortillas, and pastas. Staying hydrated is so important for your child and is often very hard to do. Hydration is critical to maintain concentration and energy levels. It’s recommend that school-aged kids drink between 6-8 cups of water a day (even more in hot weather or if their activity level is high). Here are a couple of tips to help encourage hydration in your children. Let your child pick out their favorite water bottle and encourage them to drink the whole thing at least twice at school. They’ll be more inclined to do it if they feel like they are completing a challenge. If the “flavor” of water is too boring for them, throw in a few pieces of frozen fruit to sweeten it up, and keep it cool. Always include fruit in their meals because of their high content of water. As you apply the above tips to helping you packs your child’s lunch you will find that both you and your child will be happier. They will be and feel healthier which will lead to better moods and more activity and you will feel happy for helping encourage and improve their health. Your child’s health is so important and starting to eat healthy food early will lead to lifelong habits that will stick around their whole life. Wee Care Pediatrics not only serves Davis County but we are your kid’s doctor in Weber County as well. We understand that your child’s health and well-being is your top priority and it’s ours as well. We would love to meet you and your child and help aid and promote your child’s health for a long time to come.